Happy New Year to all our family, friends, and to those friends we’ve yet to meet! Well, 2018 was quite a year of extremes for everyone, starting with the Beast from the East, followed by the most stunning hot and sunny summer. 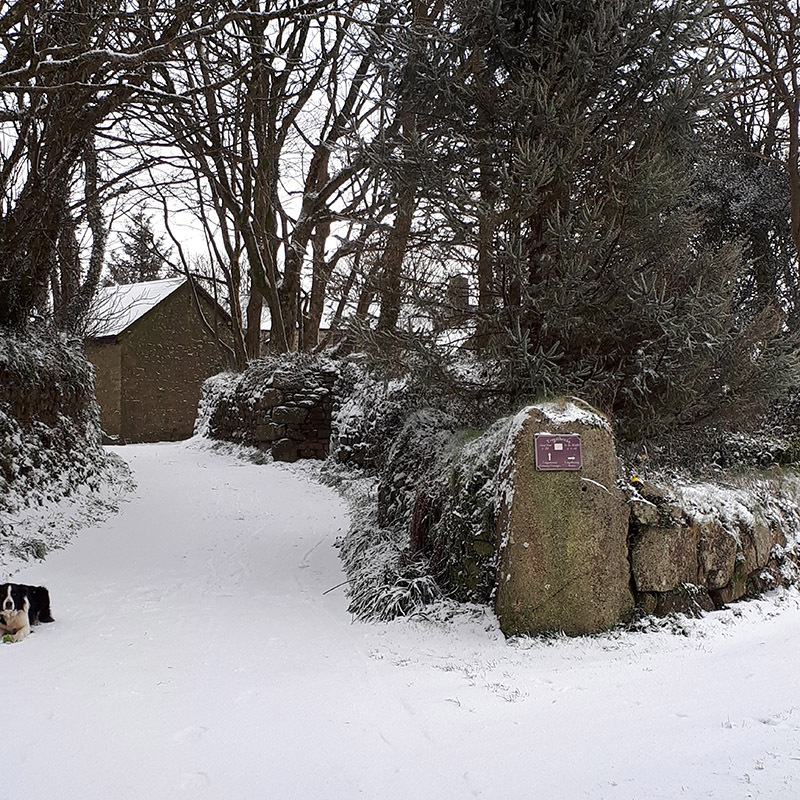 We couldn’t have chosen a worse winter to carry out the conversions to Tregathenan House. The building works were severely delayed due to the cold and wet. We were without heating and hot water until February, but luckily our wonderful builders, Nigel and Cal, and the plumbers got our new heating system installed just days before the Beast from the East arrived. 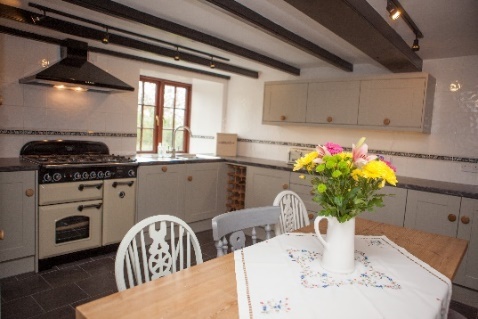 Tregathenan House has a smart brand new kitchen and utility room, and we have a huge new space comprising a laundry area, room to dry Sam, and space for our new heating system, hot water cylinder and solar boost system, which optimises the use of our PV generated electric. Tregathenan House opened to its first self-catering guests in June and we have had some lovely reviews from our first years’ visitors. September saw the closure of one of our local pubs, the Crown Inn at Crowntown. The “Crown” had provided a focal point for our small spread out community, and we made many friends and invaluable contacts there over the years. It was sad to say goodbye, but it has of course given us the opportunity (excuse) to go out and sample lots of other local pubs in the area, and there are some super ones! With one of the first big storms of the winter just hours away, Liz discovered a tiny kitten hiding under a bush in our courtyard. She coaxed her out with a bowl of food, caught her and brought her inside to see out the storm……and the rest is history! We have no idea where she came from, or how she got here, but it seems she is here to stay. 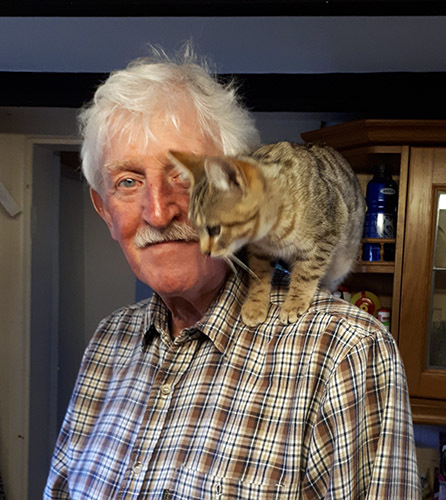 Initially named Callum, after the storm, but upon discovering she was in fact a girl, she became Storm – as it turns out the name is very suited – she is a whirling dervish of energy and naughtiness! 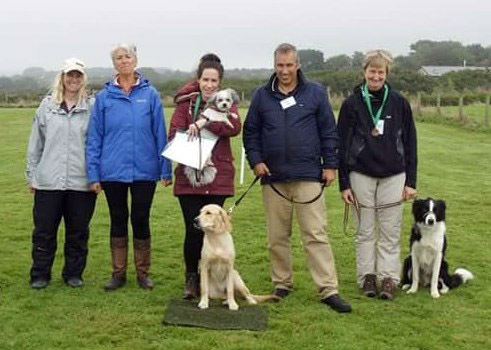 This summer, Sam started dog training classes with the ladies at BOWOW Dog Training Club www.bowowdtc.co.uk. He is a quick learner, and after just 4 lessons achieved his Bronze Award for obedience. (not sure who was more proud in this picture – Liz or Sam!) He has now started on agility classes and is enjoying learning to use all the equipment. After surviving the TB scare at the start of the year, the alpacas have had an uneventful year. 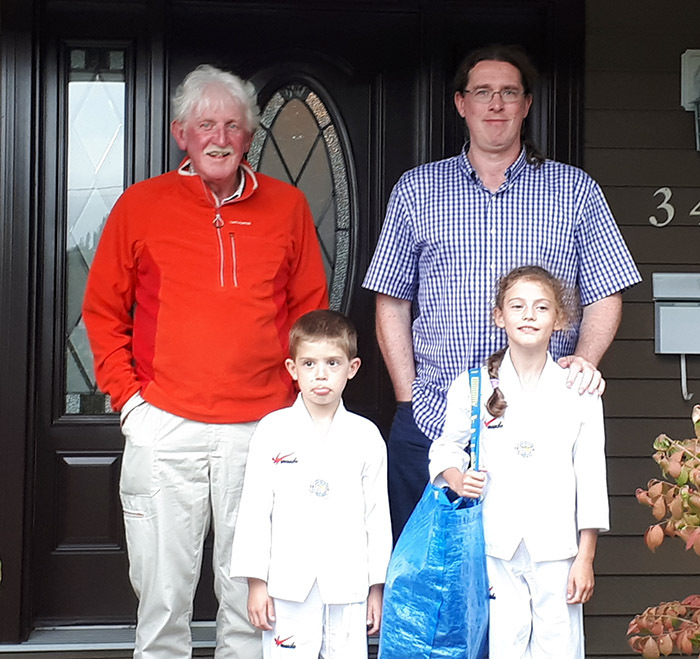 They were pleased to lose their coats just before the hot and beautiful summer arrived. We are looking forward to the imminent arrival of a pair of Toulouse geese in need of a new home and we have plans to introduce some new webbed footed friends for Basil and Sybil after Liz’s efforts to incubate a clutch of Sybil’s eggs was unsuccessful. We are blaming Basil, who is now 12, which we think is pretty ancient in duck terms and possibly he is not still quite in his prime…. Our new website was launched in April. We are delighted with the new look and feel – with lots of super pictures to help showcase Tregathenan. Special thanks to our friends at Sharkfin Media www.sharkfinmedia.com for their expertise and patience! We have had some great feedback, and hope you like it too. Please take a look for everything from availability and prices, toi the latest ‘green’ projects and ideas for your holiday. If you are a Facebook user, please like/share/follow us there as we post here from time to time. 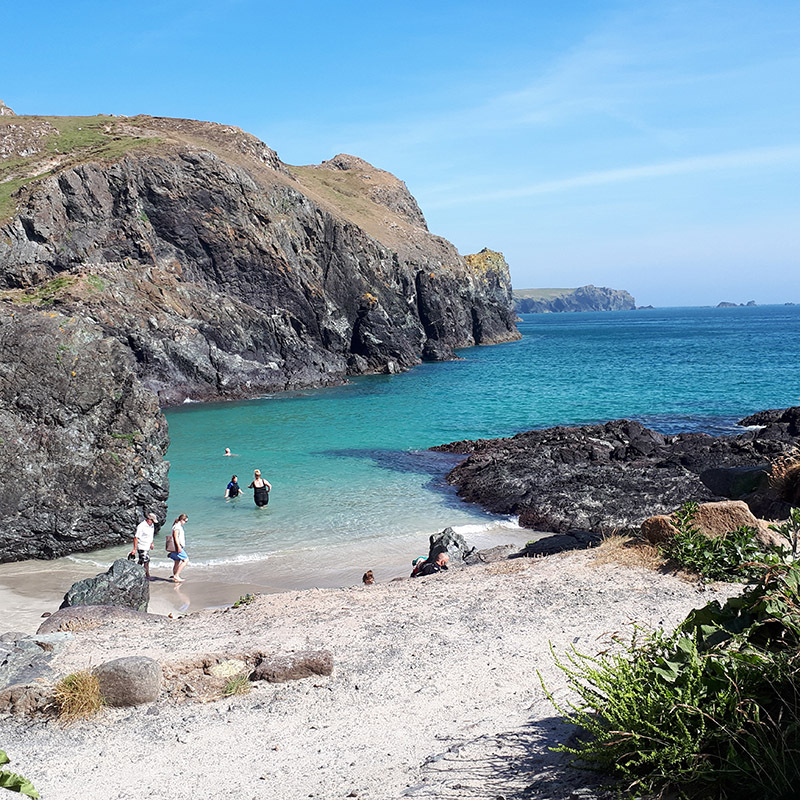 We also love getting reviews – either on Facebook, Google, or Trip Advisor – (Note, currently the Hayloft is listed under Holiday Rentals on TripAdvisor; Tregathenan House and Cottages are listed under B&B for now). 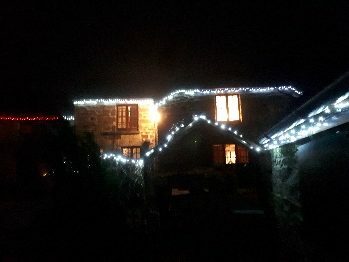 Cornish villages take great pride in their Christmas light displays, and none less than at Tregathenan! This year we invited our close neighbours to enjoy some hot jacket potatoes and chilli and to experience our very own Christmas light switch on! The lights take many hours to put up, but it’s worth it – they bring cheer to the dark December evenings and are enjoyed by our Christmas and New Year visitors. Along with many of our friends and guests, we were deeply disturbed by the heart-breaking BBC documentary ‘Drowning in Plastic’. Our guests are generally pretty good at recycling, and our plastic recycling bin is often full to overflowing. Whilst it is great to recycle, it is better to eliminate our use of plastics altogether. 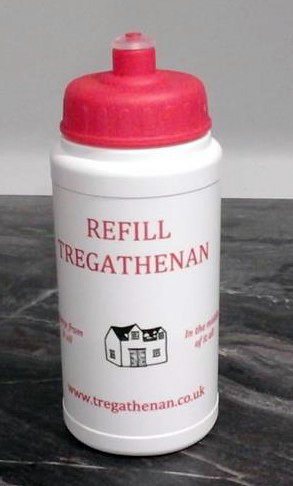 We noticed that the main contents of the plastic recycling bin was single-use plastic water bottles, so we have introduced the Refill Tregathenan re-useable bottle. Every guest is given one to use and take home. Whilst here, the bottle can be refilled (for free!) with lovely great-tasting Tregathenan tap water, and the bottle can be taken home and continue to be used as a reminder of your holiday here! 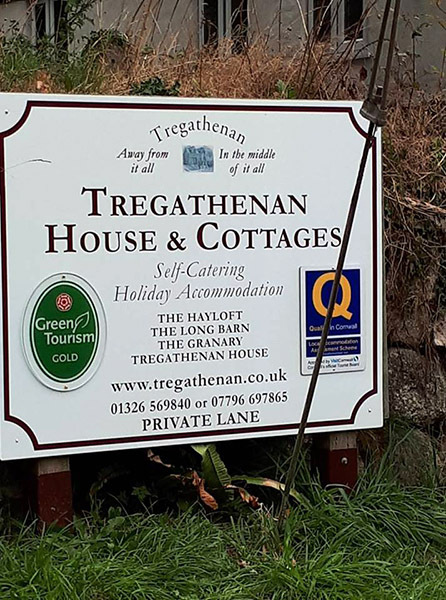 The change in use of Tregathenan House from B&B to self-catering prompted a small change in our branding from Tregathenan Country Cottages to Tregathenan House and Cottages, which was also an excuse for replacing all our signs. We also took the opportunity to review some of our policies, so you will notice that towels are now included as standard (not beach towels) and the time period for paying balances has been shortened to 6 weeks. All good news for our guests! 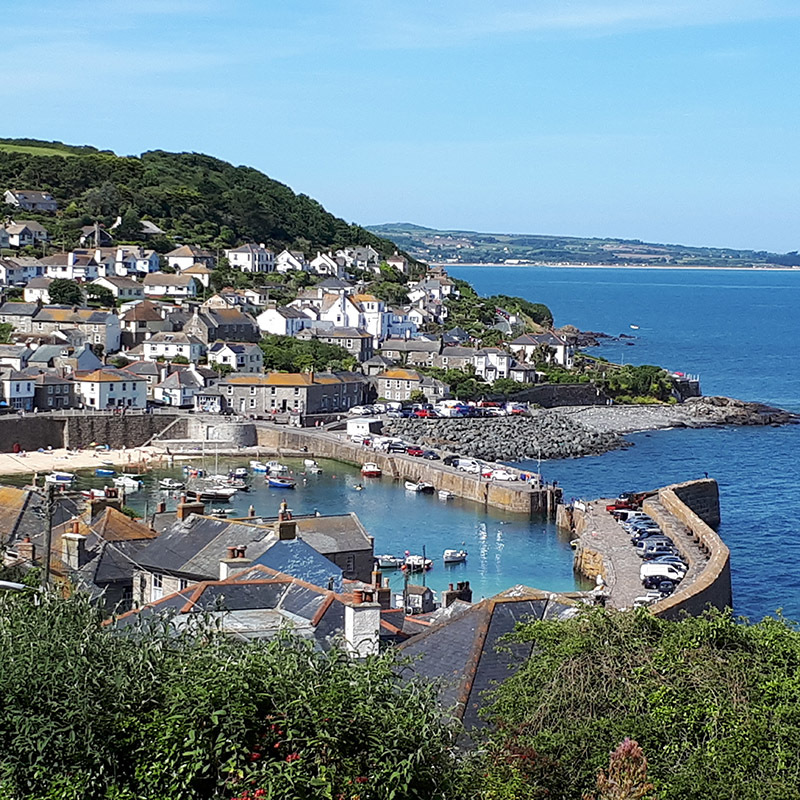 We are planning to data cable all the cottages this year and to provide each cottage with its own router, so that together with the fibre BT has run up the lane, this should considerably improve WiFi throughout Tregathenan. Also on the job sheet is the usual decorating, maintenance and grounds improvement. New carpeting is planned for the Long Barn; a new kitchen for the Granary, and a make-over for the main bedroom in the Hayloft. So that should keep us out of mischief! We hope 2019 is a happy and peaceful one for all of you, and we look forward to seeing many of you down here again sometime soon.